Hello faithful readers & possible spring breakers! Yesterday the Canucks did not get the win, and currently sit two points out of the NW Divisional lead. Stop rushing to push that panic button, there are still 20 games left in which a lot will inevitably happen and it will be a fun battle to watch down the stretch. It does not matter where in the top 8 a team finishes, just that they are in the top 8 prior to the start of playoffs. Be excited, the end of the season picture is still to be determined. 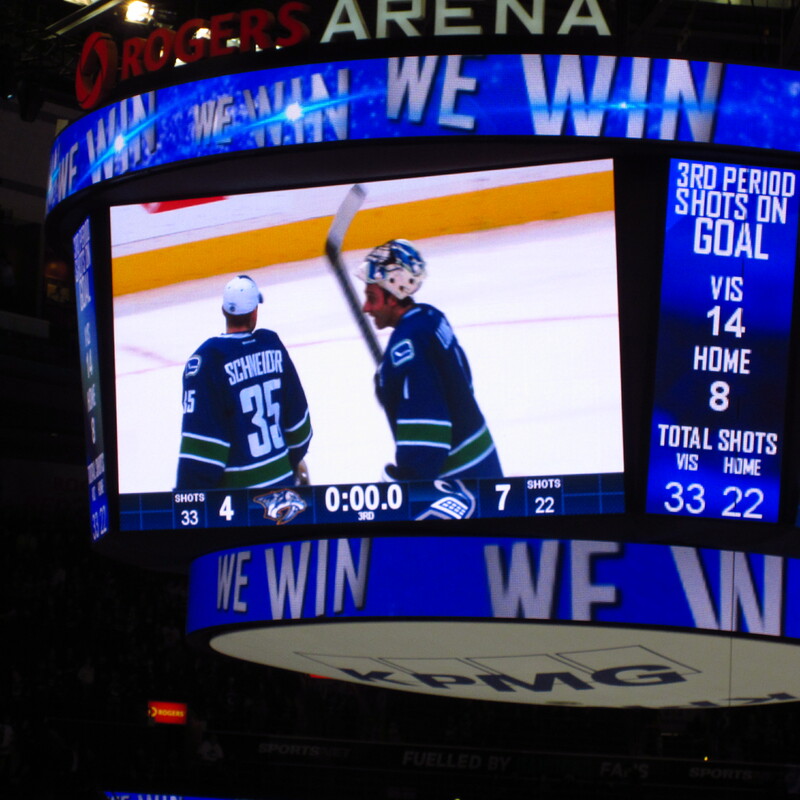 Today’s post however shall take us back to the Canucks match with the Predators. Picture it, it was Thursday March 14th 2013, a day like any other except for the fact that it was my birthday. If you have followed blog from the beginning than perhaps you remember me mentioning, it has become my special tradition to go the Canucks game every year on my birthday. This year however that tradition was put in jeopardy because of the lockout and the uncertainty of what the shortened schedule would look like. So first, thank-you to those lovely people charged with the complicated NHL scheduling task for making this tradition once more! The day started as any other game day would, checking the stats of all teams heading into all the day’s action. I like to know what’s going in the league to get myself into game day mode. Next up is getting Canucked up in team colours and making predictions for the game. I made 3 predictions that morning: Luongo would start, Kevin Bieksa would return & the Canucks would win by 3, [and if you watched the game then you know that all three of these became the end results]. The hours winded down and everyone returned from work to also get themselves ready for the game. In the end, all six of us were in Jerseys ready for puck drop. 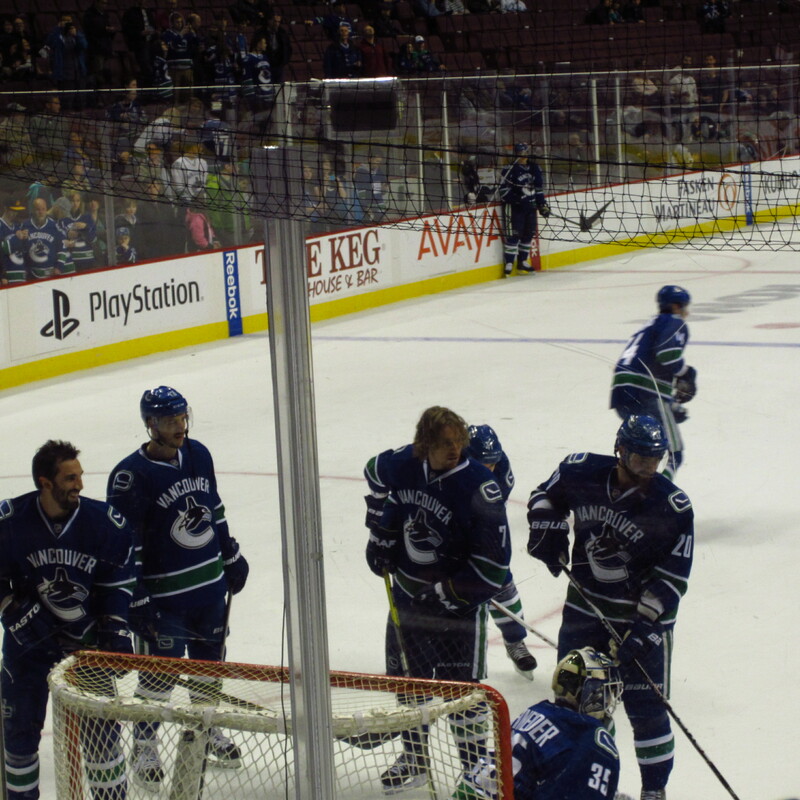 Some of my favourite Canucks[Garrison, Lapierre, Booth, Higgins, Schneids] getting game ready prior to the puck drop. The entire arena was up on their feet cheering loudly for the home side. It only took a few minutes for Nashville to respond back with their own goal tying it 1-1. For a while it seemed as though that’s how the game would stay, until an Alex Edler point shot found its way behind Pekka Rinne making it 2-1 Canucks. Nashville had some late pressure but the arena erupted in #LOUUUS as Luongo stood tall keeping Nashville at bay. The final minutes of the first period saw some incredible Sedinesque passing from Bieksa to Ebbett to Hansen to Raymond who unleashed a highlight reel wrist shot to beat Pekka Rinne giving the home side a 3-1 edge heading into the 2nd period and the crowd was on their feet once more. There was a palpable sense of ease at the end of the first period. Cue the second period when the refs beginning to hand out penalties much to the fans chagrin. Nashville had some dangerous zone time but the Canucks were able to keep the door closed and the momentum on their side. On their final clear down the ice, the puck found Lapierre just as he exited the penalty box and he made no mistake on his breakaway putting the home side up 4-1. The crowd was ecstatic and not afraid to make their cheers heard. Cue Nashville pulling Pekka Rinne for the for 3rd consecutive outing at Rogers Arena. It seemed as though the game was decided, that is until Nashville was quick to come back within two, making it 4-2. The crowd was slightly apprehensive at the quick turn around, but each time the Canucks had the puck their cheering became louder. Jannik Hansen would ensure that the Canucks 3 goal lead was re-instated before the end of the 2nd period giving the Canucks the 5-2 edge heading into the third period. Sounds pretty good, right? 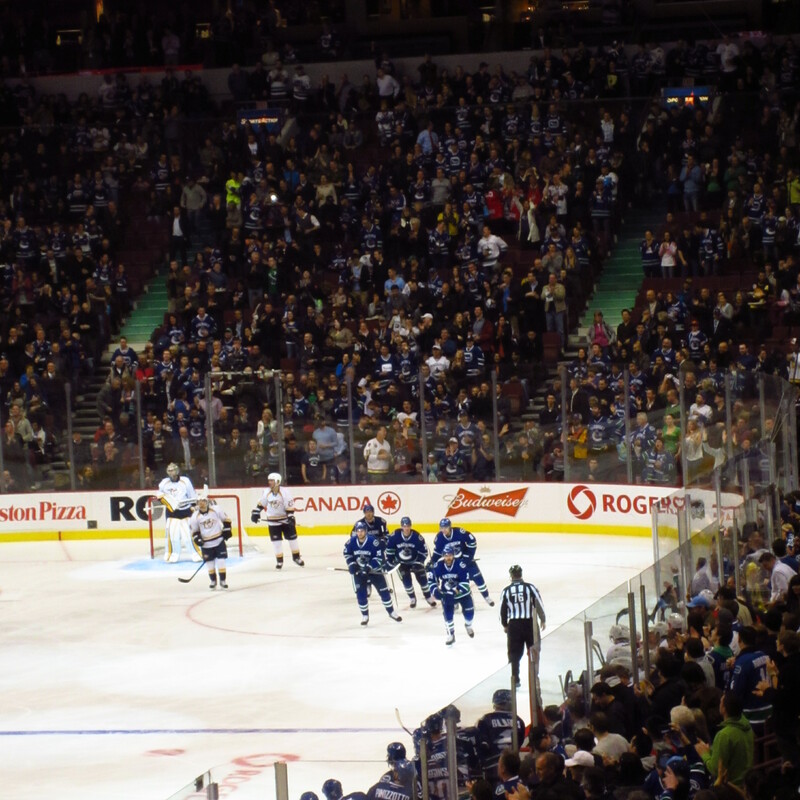 The Canucks began and ended the third period with a three goal lead. The lead nearly disappeared when Nashville launched their comeback, making it 5-3 with lots of time left on the clock, and just like that Nashville scored again making it 5-4 seemingly taking all the momentum to their side[or so they thought!]. The goal only made the fans in the stand cheer louder for the home team with just over 4 minutes left in regulation, NO ONE wanted overtime or a dreaded shootout. Heading into the final minutes of the game, Nashville had cut lead to just one and you could suddenly hear a pin drop as 18,860 fans sat in silence collectively holding their breath. Cue another shift in the game as the Canucks instead of collapsing started a charge into the Nashville zone with Henrik leading the way. It looked like he was about to score before he got taken down and much to Nashville’s dislike, the Canuck Captain was awarded a penalty shot. Coach V wanted a powerplay but was not given one and Hank had to take the shot. 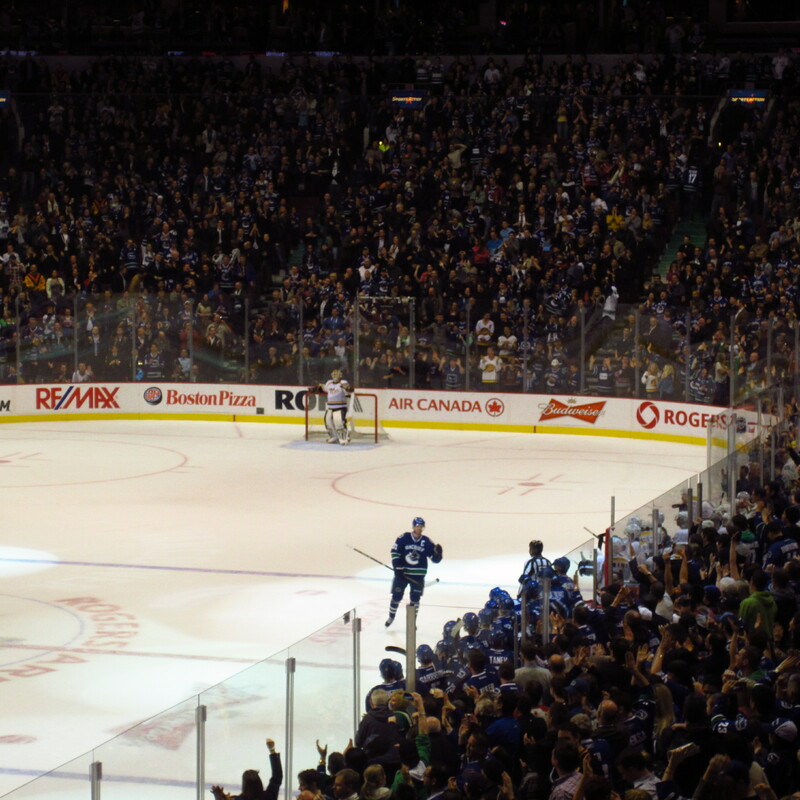 As Henrik skated to centre ice, the entire arena stood in silence hoping to see the goal light come on. When he pulled that move and gently slid the puck in the net, the entire arena was jumping, cheering and high 5’s all around!!!! Henrik skated in all sly, faked Mason to force him out the net only to gently slide the puck into the net…SCORES!!!! The entire arena went crazy, the atmosphere was electric. Henrik’s penalty shot goal seemed to calm the crowd with just over 2 minutes left. Nashville did indeed pull their goal-tender for one last chance to tie the game or pull within one. However what occurred is what seems to happen more than not when a team pulls their goalie, the team that was ahead added to their lead. After many close calls, Booth finally got his first goal of the year[thanks in large to Lapierre who could have taken the shot himself instead of passing the puck to Booth]! The home was now ahead 7-4 with the entire crowd still on their feet. As the final buzzer sounded the team jumped from the bench to celebrate the WIN at home with a salute to the fans. It was great to be there in the stands, especially for that Henrik penalty shot goal[that was insane! the guy should seriously be in shootouts more often!!!]. I am so very ecstatic that my birthday tradition is one that got to continue despite the lockout. Thank-you to the Canucks for getting the win and helping to make it a very memorable outing! And here is my favourite shot of the night: LOU & SCHNEIDS! Lou & Schneids celebrating the 3/14 win vs. Nashville. Back to business for the Canucks as they are right back at it tonight. Heading into tonight’s game the Canucks will be looking to get back into the win column when they face off against the St.Louis Blues. Puck drop is just after 7:00 PM[pacific time]. David Booth is out with an injury he suffered in the Detroit game and Zack Kassian will return in the line up. It will be interesting to see how it goes! #GoCanucksGo! Lou & Schneids: Best Friends Forever! What do you think Canucks fans? I thought it was hysterical and hope it makes you laugh as well! Thanks to TSN for sharing this gem of a video! And in case you didn’t hear, it looks like Louie’s starting tomorrow!